Steak restaurants can be a minefield of cuts and weights that can feel overwhelming for the uninitiated. At Finsbay Flatiron they take any uncertainties away by offering only one cut of meat: a flat iron 8oz steak. 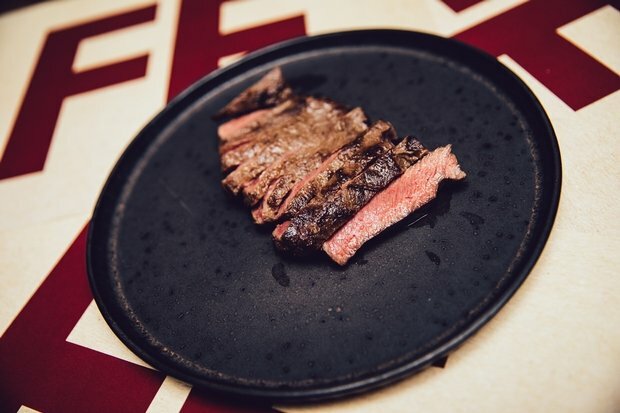 The concept (similar to London’s Flat Iron Steak restaurants) excels due to its simplicity – it’s inexpensive, yet high-quality and delicious. Alongside the flavoursome cut of steak, there’s a neat choice of sauces, such as classic garlic butter or a quirky chipotle funk. There’s also a substantial list of sides on offer such as a creamy, satisfying mac and cheese topped with pancetta, or the double-dip hand-cut chips with thick slices of parmesan and a generous serving of hollandaise to mop up. Finishing off with a homemade-style tiramisù from the specials dessert menu perfectly rounds off this savoury feast with something sweet. The wine menu and cocktail menu change regularly and you can expect some twists on classic serves, like their Espresso Martini with a shot of hazelnut and tonka bean. The chilled-out atmosphere and staff mixed with the buzzing bar area makes this a fun and casual spot that doesn’t take itself too seriously. Music on stereo: Old school rock and disco. Live entertainment: Wednesday night open mic. Plus band play regularly.